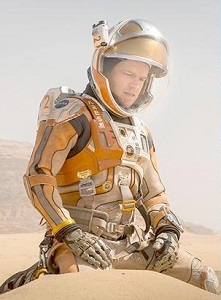 In THE MARTIAN Mark Watley (Damon) is an Astronaut with a background in Botany. He's part of a crew of 5 sent to explore Mars. All is witty repartee and good natured barbs at one another, over the spacesuit intercom until a storm on Mars comes whipping up. The captain, Melissa Lewis (Jessica Chastain) quickly assesses the situation and decides it's time to abandon the mission and head back to earth. Watley disagrees, but mid sentence he's struck by an antennae; and with all the dust and wind, visibility is impossible, he's out of sight. The crew doesn't want to leave him behind, but when they can't get a signal from his suit, it's Melissa's call to leave him for dead. But of course he's not dead and upon waking up abandon, Watley becomes Macgyver 2.0 in space! There's nothing he can't think up, fashion, figure out, come up with, fix or maneuver. It's like this guy took one of those Limitless pills! I mock to be humorous, but in actuality Ridley Scott's The Martian, based on a book by Andy Weir, is completely believable, the production is mind blowing, just as good as Gravity, the science feels credible and the script is acutely intelligent without being dense. I got to attend a panel discussion to promote The Martian in Philly at Fels Planetarium at the Franklin Institute moderated by Chief Astronomer Derrick Pitts. The participants: were two cast members from The Martian, Sebastian Stan (Mars crew) & Mackenzie Davis (Mission Control), retired NASA astronaut, Nicole Stott and Dr. Jim "Mr. Mars" Green - Director of the Planetary Science Division at NASA, also the film's consultant, and lead scientist on the announcement this past week on the discovery of streaks of water on Mars. As I said, the movie feels completely realistic, but don't take my word on it - during her time at NASA Astronaut Stott spent 91 days on the International Space Station and 6 hours outside doing a space walk. She had nothing but praise for THE MARTIAN and particularly felt they got the camaraderie, both professionally and personally completely right between the crew and the crew's relationship with Mission Control. Actress Mackenzie Davis discussing her training for "The Martian"
Mackenzie Davis (That Awkward Moment, What If, Breath) plays a young Communications Engineer at Mission Control, who discovers Mark Watney is still alive. She notices a discrepancy on the monitors transmitting different images from Mars after the crew's departure. Davis was asked during the Q&A about her interest in space and whether space exploration is a worthwhile endeavor. Davis says getting this deeper understanding of what NASA does has been amazing and that since she was a little girl she's been fascinated by black holes. She's even imagined going on a space expedition, but for some reason never imagined coming back. She has since had a chance to visit Johnson Space Center (NASA) but did not get to go ahead of filming the movie. She was able to converse with consultants prior to the movie - however, she contributes most of the authenticity to Ridley Scott's interactive, immersive sets and amazingly real environments. Sebastian Stan (Captain America, Gossip Girl series) said the movie reinvigorated his interest in science and space exploration. He was asked how much astronaut training he was given prior to shooting? His response, not much. Most of the physical training pertained to mastering the wires used to make them look as if they are weightless and floating around the ship. He said it's a lot harder than it looks, you're in a big heavy spacesuit that is not weightless, and gravity & physics tend to spin the person on the wires in a way that would not take place if you were actually in space. I even got to ask him a question! 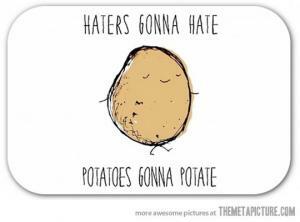 Food n Film: Mark Watley figured out how to ration his Martian grown potatoes, but he forgot to ration his ketchup, so he dips his potato into some Vicodin. Hey, when you're alone on your own planet, why the hell not!